Every single Apple product in every promotion photo is set to 9:41am. While this seems a small detail, it’s one with great reasoning: Steve Jobs wanted the devices to reflect the time (or just about) when being shown at the product launch presentations. These images are usually shown about 40 minutes into the presentation, and so when Jobs unveiled the first iPhone at 9:41am, the image of the phone was set for 9:41 am. 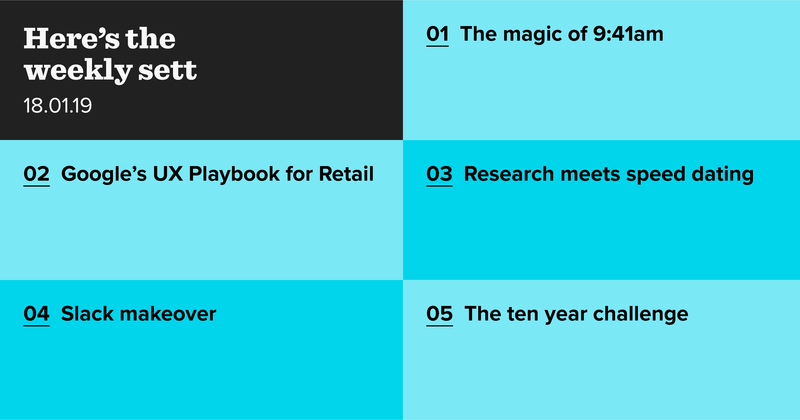 Learn more about this in plain sight Apple secret at Inc.
Google has launched its UX Playbook for Retail, which outlines the best of the best in retail user experiences, as well as some key takeaways to consider for your own UX designs. The best includes Boots’ homepage, Warby Parker’s form optimisation, and Sephora’s search. Research is a key component of any project, and getting the facts and figures you need can be the linchpin that makes a project great. Dropbox Design (musings from the Dropbox Design team) has collated an approach to research if you’re not a design researcher. The piece outlines their approach: Real World Wednesday, which acts as a speed-dating style research session with internal employees and/or external people. The method allows you to test WIPs, mocks, and ideas in their infancy. Slack, the workplace chat app has unveiled its new logo, replacing the multicolour hashtag with a pinwheel-esque form. While the colour scheme remains mostly the same, the lowercase ‘slack’ word-mark has gotten a minor tweak. Learn more about the changes and judge the update yourself over on The Verge. In case you missed it, everyone is looking back to how they looked ten years ago. While some have shared some embarrassing fashion choices, questionable haircuts, and some choice poses, others have looked to share how the internet has changed. Check out Ryanair’s ten year challenge showing how its website has (thankfully) changed.